This product requires the base game Tom Clancy's Rainbow Six Siege. Wrap your JTF2 weapons in the Racer weapon skin. 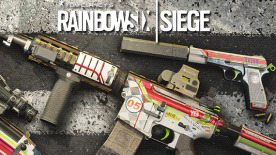 This pack unlocks the Racer weapon skin for all of your JTF2-specific weapons. Go to your loadout to equip this skin. © 2015 Ubisoft Entertainment. All Rights Reserved. Tom Clancy’s, Rainbow Six, The Soldier Icon, Ubisoft and the Ubisoft logo are trademarks of Ubisoft Entertainment in the U.S. and/or other countries.